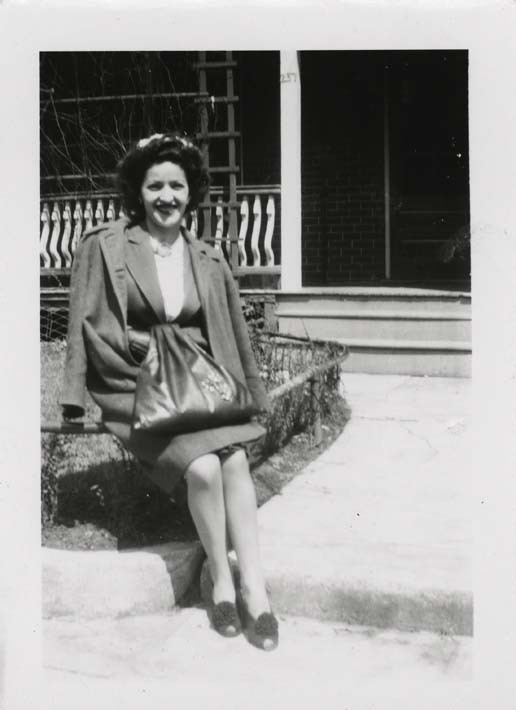 This is a black and white snapshot of Antoinette (Toni) Ciccarelli sitting on a wooden fence outside a house, smiling at the camera. This picture was taken on the same day as pictures, DICEA2010.0001.0012 and DICEA2010.0001.0013, as Toni is wearing the same outfit. She is wearing a pin-striped suit jacket with a matching skirt, a white button shirt, a pair of leather gloves, a small hat, a large dark coloured handbag, and a knee-length coat. The background shows a brick house with white railings on the porch.